Recognizes a protein of 27 kDa, identified as the Bcl-X protein. Jurkat, K562, HL-60, or HeLa Cells. 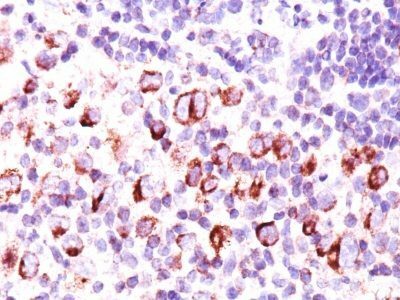 Reed-Sternberg cells in Hodgkin’s lymphoma. Recognizes a protein of 27 kDa, identified as the Bcl-X protein. This MAb shows no cross-reaction with Bcl-2 or Bax protein. Bcl-X has two isoforms, Bcl-XL (long), a 241 amino acid protein which suppresses cell death. And Bcl-XS (short), a 178 amino acid protein lacking a 63 amino acid domain which functions as a dominant inhibitor of Bcl-2. This MAb reacts with both Bcl-XS and Bcl-XL proteins. 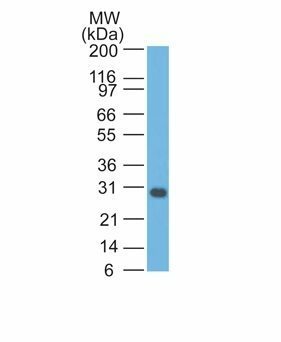 Catalog number key for antibody number 0752, Anti-Bcl-x (BX006 2H12) The prefix indicates conjugation, followed by the antibody number and size suffix.